Comedy Against Humanity, an improv show inspired by darkly humorous card game Cards Against Humanity, is closing. 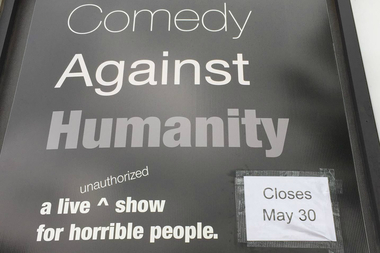 LAKEVIEW — Improv show Comedy Against Humanity is set to close amid fears its host, Under the Gun Theater, could be sued. The show takes its inspiration from Cards Against Humanity, a darkly humorous card game similar to Apples to Apples. Comedy Against Humanity is not sponsored by the card game, and it bills itself as "an unofficial spinoff show" online. Theater founder Angie McMahon said Under the Gun Theater had an informal arrangement with Cards Against Humanity, with Cards representatives approving the show's name and advertising graphic. That arrangement started to fall apart in April when Cards Against Humanity saw a train ad for the improv show and objected to it, saying the graphic was too close to the card game's imagery, McMahon said. McMahon said she tried to work with Cards founder Max Temkin to make changes but he stopped responding and, fearing being sued, the theater decided to close the show. Its last performances are 10:30 p.m. Friday and Saturday. Tickets cost $15 and are available online. Comedy Against Humanity audience members received three white cards and were split into one of two teams at the beginning of each show. A "card czar" pulled a black card and audience members submitted their white cards to try and create a funny combination with the black card. The czar chose a winner and a team of improvisers would act out the scene created by the combination. The audience teams earned points for having their combination chosen and were awarded prizes: beer koozies, gift cards and candy, among other items. The theater would "love" for the show to return in the future, McMahon said. "It would be up to Cards Against Humanity," McMahon said. "We can't afford a litigation." Temkin and Jenn Bane, Cards Against Humanity community manager, did not immediately respond to requests for comment.